Skip Hire Plan: "Big Ben's Bag"
By Placing this order you are requesting the collection of a FULL Big Ben's Bag. 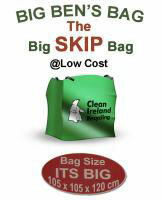 If you require an empty bag please Contact Us. 8. Fee paid covers max weight 2 tonnes.